Barbados Surprise, can be described as an aqua multi-chrome with assorted UCC flakies, iridescent flakes, assorted microflakies and scattered holo. I chose the Barbados Surprise Cocktail as my inspiration. 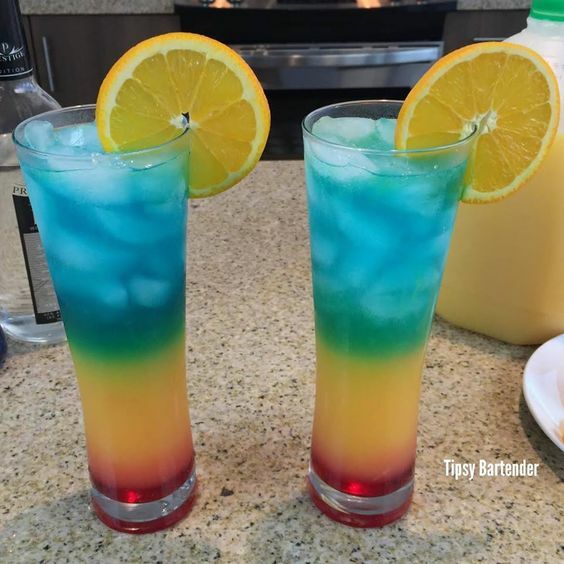 This Carribbean-themed drink is so beautiful and looks like a liquid rainbow! The drink combines grenadine, orange juice, rum and Blue Curacao. (Click recipe link below.) The base color of the polish represents the dominant aqua color of the drink. The iridescent flakes, represent the ice cubes. And the shifting mutli-chrome shimmer, UCC flakies and holographic pigment represent the other spectrum colors that appear layered in the drink. Inspiration photo by @tipsybartender. For recipe, click here.